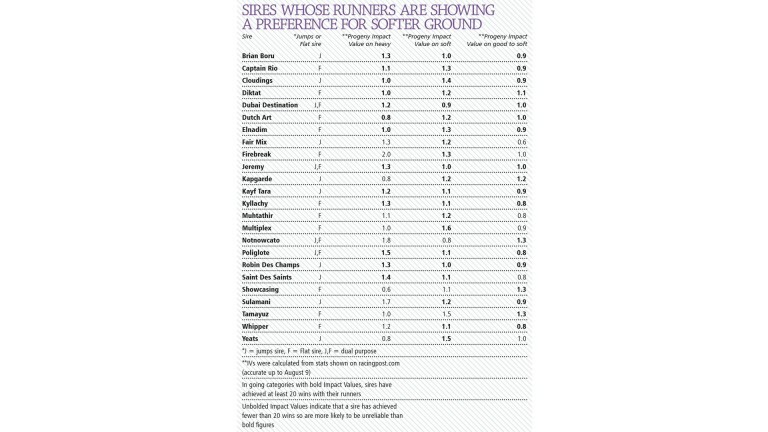 Sire stats can be extremely insightful with regards to whether a runner is likely to be suited by the ground given the progeny of some sires can show a strong general preference for a specific type of going. I’ve identified such sires using the Impact Values of their runners on different official going types. This enabled me to put sires into categories based on which going types suit their runners: soft-ground preference, fast-ground preference, unsuited by testing ground, and unsuited by fast ground. An Impact Value considers the level of opportunity a sire’s progeny have had to win races on a particular going type and measures this against the number of races the progeny actually won. Let’s say the going was good to firm in 50 per cent of the races a sire’s progeny had contested. You might reasonably expect based on this figure that 50 per cent of their wins will be achieved on good to firm going. However, if this sire’s progeny typically prefer good to firm, the number of wins achieved on good to firm will be disportionately high. In our example, more than 50 per cent of their wins will be achieved on good to firm. An Impact Value (IV) is calculated by dividing the percentage of wins achieved on that going by the percentage of runs on that going. A value bigger than 1 (percentage wins exceeds percentage runs) suggests a sire’s progeny are performing better than you might have expected so implies a preference for that going. The bigger this value the stronger the preference. For a sire to be considered one who produces unusually high numbers of horses suited by softer ground, IVs needed to be 1.0 or higher on two of the three softer going descriptions (good to soft, soft and heavy). Additionally, on at least one of these descriptions a sire’s progeny must have 20 plus wins with an IV of 1.2 or higher. Several of the Flat sires in our table can be connected through a common sire in their pedigrees. Captain Rio and Kyllachy are both by Pivotal, Diktat and Firebreak are descendants of the Warning sireline, while Dutch Art and Whipper have Mr Prospector in the top side of their pedigrees. Pivotal gets plenty of winners on different going types (see Part 4) and his son Captain Rio relished soft ground. The respective IVs of Captain Rio’s progeny of 1.1 and 1.3 on heavy ground and soft ground illustrate how horses can inherit their sire’s going preferences, which is worth keeping in mind when considering which ground will suit runners by fledging sires. Kyllachy won on soft ground and fast ground but many of his runners are most effective on slower going. Six of his top 12 runners based on best RPRs achieved, recorded their peak ratings on ground slower than good. This is higher than expected given a third of his offspring's runs came on these going types. French-bred sires make up a noticeable chunk of the jumps/dual purpose sires in table 1 adding ballast to the perceived wisdom of French-bred jumps horses acting on soft ground. Progeny of French-bred sires Robin Des Champs and Saint Des Saints are finding favour with powerful Irish trainers and a factor in their popularity is their ability to cope with soft ground which is prevalent in Ireland throughout much of their jumps season. Robin Des Champs has sired Grade 1 winners Vautour, Sir Des Champs and Quevega, while Saint De Saints has produced staying chasers Djakadam and Quito De La Roque, who are both Grade 1 winners on soft or slower going. For a sire to be considered one who produces unusually high numbers of horses suited by fast ground, IVs needed to be either 1.2 or higher on good to firm, or 1.2 or higher on firm and 1.1 or higher on good to firm. Additionally, a sire’s offspring must have 20 wins plus on good to firm and when a sire’s good to firm IV was between 1.1 and 1.19, 20 plus wins on firm. Strikingly, half of the 24 sires in our table are descendants of Danzig. His stallion sons Danehill and Green Desert are in the sirelines of five and six of these sires respectively. 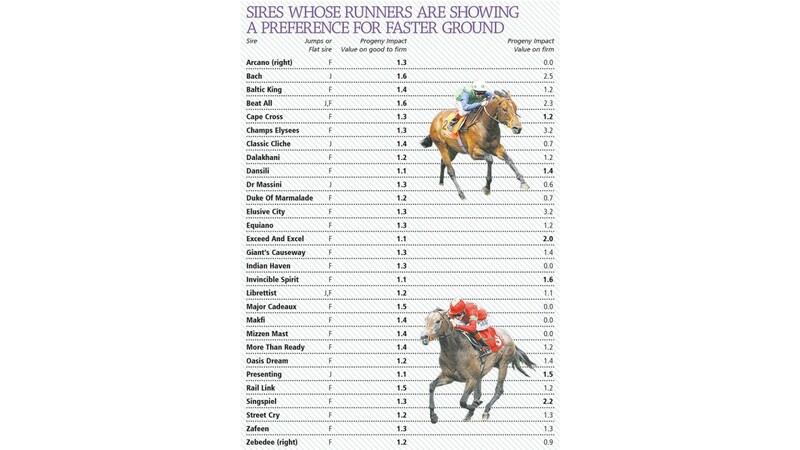 Danzig is a strong speed influence, so although many factors determine whether a runner acts on a type of going, namely their knee action, the abundance of sires from his line in our table seems to underline how quick ground conditions can favour innately speedy horses, particularly those with a turn of foot. This line is represented by Baltic King, Champs Elysees, Dansili, Duke Of Marmalade, Exceed And Excel and Rail Link. Brothers Champs Elysees and Dansili are sons of Danehill and from a family of classy horses suited by fast conditions - sisters Banks Hill and Intercontinental both won Grade 1s on firm ground. Dansili was beaten a neck and a nose when third in the Breeders’ Cup Mile on firm ground and ten of his 11 runners who have recorded a 120 plus RPR achieved their best figures on good or faster. One of the ten is Rail Link and he seems to be passing on a fast-ground preference to his progeny, who are showing IVs of 1.5 on good to form and 1.2 on firm. Champs Elysees won the Canadian International on firm and his five progeny who have posted a RPR of 110 plus achieved their best ratings on good or faster. A Danehill sire producing progeny who handle really fast ground is Exceed And Excel. His offspring’s IV on firm is a high 2.0. This could be a factor in why so many have run well on the straight course at Ascot which benefits from excellent drainage meaning in dry periods the racing surface is really quick. Blindly backing Exceed And Excels in Ascot straight-course races is yielding a £1 level-stakes profit of £192.22 (29 wins from 250 bets). Five sires in our table are descendants of this line. Cape Cross, Invincible Spirit and Oasis Dream are sons. He is a grandsire of Arcano (by Oasis Dream) and Zebedee (by Invincible Spirit). Cape Cross has produced two Derby and Arc winners, Sea The Stars and Golden Horn, and these two world beaters were ideally served by decent ground. His classy daughter Ouija Board had a marked preference for fast ground. When you analyse the going preferences of the best horses Invincible Spirit has produced, most have favoured quick conditions but have acted on slower ground. An attribute all share is a high cruising speed. For example, Kingman won the Irish 2,000 Guineas on soft to heavy but registered his best RPR of 128 on good. 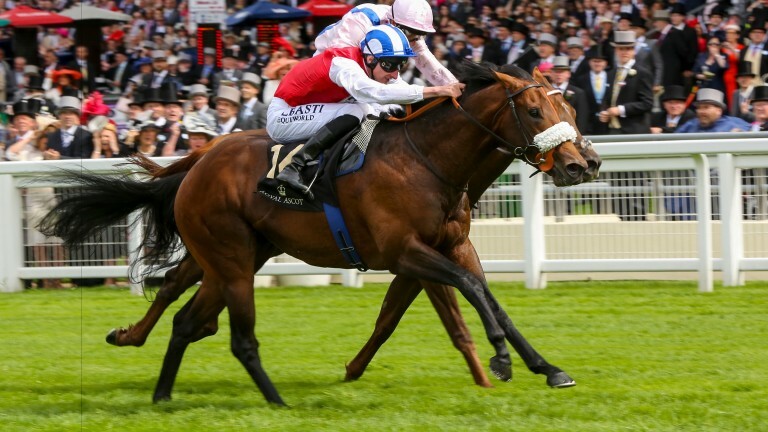 This season’s King’s Stand winner Profitable is another Invincible Spirit who handles slow ground – underfoot conditions were soft when he won that Ascot Group 1 – but his trainer Clive Cox is adamant he is a better horse on fast ground. We may not have to wait much longer to find out whether Cox is right. Profitable is favourite for next Friday’s Coolmore Nunthorpe. Third-season sire Zebedee was a speedy two-year-old who won on good to soft, but his best three RPRs came on good or faster. He is the sire of sprinter Magical Memory who relishes quicker conditions. Oasis Dream is another Green Desert sire whose classier progeny often favour faster ground, but, as with Invincible Spirit, a number of his top performers have coped with easier conditions. His champion sprinter Muhaarar proved effective on good to soft on his final appearance when winning the Champions Sprint. However, some Oasis Dreams are strongly dependent on fast ground. Goldream, who won the King’s Stand and Prix de l'Abbaye last season, must have quick ground. The following are sires with poor records with their runners on heavy ground: Librettist (no wins from 31 runs, IV 0), Dalakhani (9-161, IV 0.48), Street Cry (4-86, IV 0.40) and Royal Applause (15-334, IV 0.50). It may be worth avoiding progeny by these sires on testing ground when they are unproven in the conditions. War Front is a sire Coolmore have invested heavily in. Indications from the limited numbers of his progeny to have run in Britain-Ireland are that they are often less effective on testing ground. His runners are 4-29 (14 per cent) on slower than good to soft versus 61-261 (23 per cent) on good to soft or faster. Four jumps/dual purpose sires with poor records with their runners on good to firm or faster are: Astarabad (1-40, IV 0.2), Brian Boru (7-122, IV 0.56), Flemensfirth (49-684, 0.7), Shirocco (2-13, 0.72) and Yeats (5-60, IV 0.69). A paucity of Flat sires are showing IVs lower than 0.7 with their runners (minimum of 30 runs) on good to firm or faster. Two sires who do fall under this banner are Roderic O’Connor (4-80, IV 0.5) and Dream Ahead (9-82, 0.63), although both are young sires so their records should be viewed with caution. Three well established sires with low IVs with their progeny on good to firm or faster are Authorized (44-397, IV 0.76), Mastercraftsman (32-352, IV 0.75), and Manduro (25-299, 0.72). These sires can get fast-ground winners, but usually their offspring don’t want the going to be overly quick. Impact Values are useful in detecting going preferences, but identifying sires who are enjoying high levels of success with their runners on all going types is better achieved with a different method. I took the view that such a sire would have healthy strike-rates with their runners on each of the more common official going descriptions, which I deemed to be good to firm, good, good to soft, soft, and heavy. The following sires have strike-rates of 12 per cent of higher (minimum of 50 runs) with their runners on all of these descriptions: Dubawi and Pivotal, and three sons of Sadler’s Wells; Galileo, King’s Theatre and Poliglote. You could infer from their impressive figures that many progeny by these sires are likely to be versatile with regards to ground. Galileo’s most decorated son is Frankel. He won on every description between good to firm and soft so it will be interesting to see whether Frankel’s progeny prove to be as adaptable. The tendency of sires to pass on ground preferences to their offspring is on a trainer’s mind from sale ring to stable to racecourse, and no matter how inexact the science may be, it simply can’t be ignored. James Given – currently pondering the fact sprint ace Mecca’s Angel spends her life waiting for give in the ground, while her mother Folga, “wanted it like a road, or rather like concrete, because tarmac was too soft” – is in no doubt that preferences are almost always there, even if they’re not always apparent. “Most sires pass on their preference but their preference is pretty normal,” says the Lincolnshire trainer. “If a sire’s preference is for good ground, most of their offspring will get away with it between good to firm and good to soft and there will be no perceived preference. It’s only when a sire has a preference for something more extreme that you start to notice it. “Even then, though, you can’t say ‘a Sadler’s Wells must have soft ground’ or ‘a Pivotal must have soft ground’, but there’s an overwhelming preference among some sires’ progeny for certain going. Henry Candy, who has a close-up view of the phenomenon as trainer of prominent sire Kyllachy and his dual Group 1-winning progeny Twilight Son, is in no doubt it is a fact rather than a myth. “I think it’s a very marked tendency,” he says. “There are exceptions to every rule, but you don’t get many Kodiacs who like soft ground, for example, despite the hundreds of horses he’s got running around, and Kyllachys definitely like a bit of a cut like he did, so it’s a trend worth noting. “Twilight Son is probably a bit more versatile than a lot of them but he definitely doesn’t like very firm ground, and both of his win at the top level came on good to soft. Brian Ellison recognises the importance of noting trends due to particular sires, points out that the Pivotal offspring he’s trained have been better with give in the ground and indicates a few angles that don’t necessarily spring to mind. “Dubai Destination and Piccolo have been good influences on the all-weather, I’ve had success with horses by those sires at the likes of Southwell, but obviously they have plenty of winners on turf as well. Hughie Morrison emphasises this is not a black-and-white area, and the conformation of a sire’s progeny may have more bearing on its going requirements than its pedigree. “If a horse needs soft ground, it may be because of flaws in the way it’s made. It might be a horse who hits the ground particularly hard, so it would appreciate a softer surface whatever its pedigree may suggest.